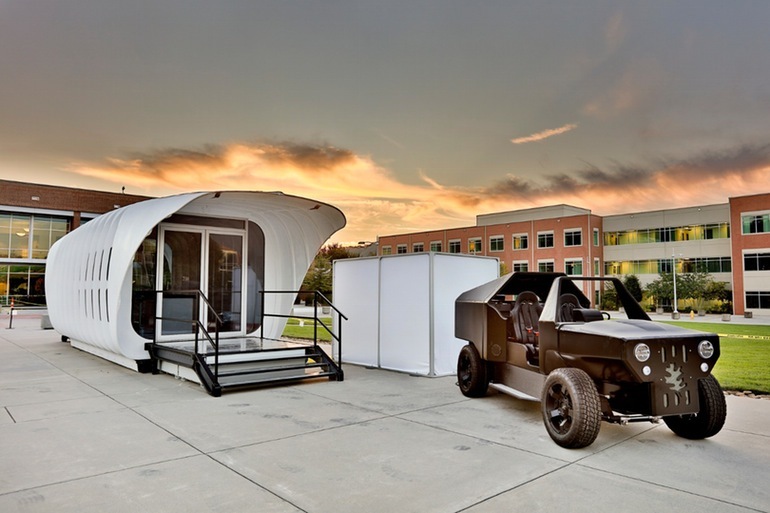 If you’ve dreamed about 3D printed cars and 3D printed houses, researchers at the Oak Ridge National Laboratory’s Department of Energy have answered your prayers, Gizmag reports. The team have developed a car that looks like a heavily modified Jeep and a single-storey residence that resembles a caravan from the future that can fuel each other when one runs out of power. The technology, called Additive Manufacturing Integrated Energy, or AMIE is the world’s first bi-directional power system. On top of the stationary building is a series of photovoltaic cells connected to car batteries normally found inside Fiat’s 500e. The batteries have been fitted with a bidirectional wireless power transfer (BWPT) system that can send power wirelessly to the car or vice versa. That means if it’s cloudy out, your car can keep the lights on at home. Around 80 percent of the house and 30 percent of the car were both printed using carbon fibre-reinforced plastic, with the latter featuring a natural gas and electric powered engine. But if the boxy Jeep look doesn’t suit, new parts can be quickly printed and fitted with ease. Sadly, the car can only do 60mph and have a range of 35 miles, which is just a tad short considering 34 percent American travel more than the range of the car on the commute. “In the AMIE demonstration project, we are trying to illustrate what our future might look like if we shared our energy streams for buildings and transportation, using additive manufacturing as a tool to drive rapid innovation,” ORNL’s Roderick Jackson, who led the AMIE demonstration project, told Gizmag. For now it’s just a concept, but someday your home might not need the electric grid at all to keep your digital life powered up.